It could be an advertisement for some super blue detergent, but the Baie des Anges on the Côte d’Azur is not chemically enhanced. The sea really is the colour of the cloudless sky. I feel summer bliss lying under an umbrella reading Werner Spies catalogue essay of Robert Longo’s MAMAC  retrospective. Occasionally I look up to the horizon or dip into the cool sea whilst Christina and Oscar play in the shallows. We have come here to enjoy the beach and the restaurant, Castel, with its sun-beds tucked into the corner below the Quai des Etats-Unis, right under the Hotel Suisse where Raoul Dufy used to paint and just opposite Vieux Nice. From my prone position I can see the yellow house where Henri Matisse once lived, the roller door on his large studio window half open. Maybe even Matisse’s ghost continues to enjoy the blue of beyond. I return to reading Spies’ engaging and convincing essay where he links Longo’s imagery and technique to the film, On the beach. It immediately takes my mind back to Melbourne, the city I grew up in and where I studied at RMIT University. For a year I lived opposite the school in the Oxford Hotel, a hotel catering to students in a fading glory of its former self. It’s where Ava Gardner and Gregory Peck stayed whilst filming Stanley Kramer’s film about the last survivors of a nuclear holocaust. Gardner was quoted as saying that Melbourne was an appropriate place to make a film about the end of the world! If only she were alive today to see the vibrancy of a city transformed. Nuclear annihilation is a long way from my mind as Castel spray us with a cool non-radioactive mist as we take morning coffee. On the way back to my beach bed I pick up an invitation to Nöel Dolla’s latest exhibition,  but I do not need to leave the beach to see his work. 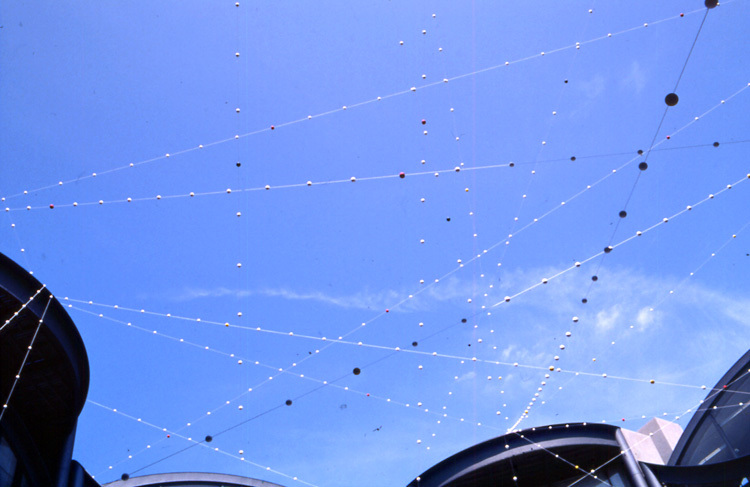 Overhead at Castel is Restructuration spatiale (1971 – 2009), a work consisting of polystyrene balls playfully dangling from the canopy, all coloured similar to the warning flags on the beach. For a number of years Dolla has organized exhibitions under Castel’s awnings and this year it consists of his former students from Nice’s Villa Arson. They include David Ancelin, who fills a life buoy with concrete and places it in the outdoor showers. Fingered into the concrete is a love heart and presumably Ancelin’s phone number, making the buoy useless for saving lives but maybe a functional calling card. A bright orange life-vest is encased in an emergency glass cabinet whose practicality is disrupted by the formality of a black tie hung casually around the neck of the jacket. Another work is a photograph of cacti which has text inscribed into its soft flesh by Benjamin Hugard. The text references gunplay and murder in America and is titled Dead Kennedy’s, 1959-2009 (I fought the law). Dolla and some of his fellow exhibitors also teach at the threateningly named Villa Arson, an art school a tram-ride away from the beach. This art school has an autonomous campus, accommodation, restaurant and an art centre that is highly regarded internationally. One would imagine that Castel would not be a place where most aspiring Villa Arson art students would consider exhibiting, and therefore it is refreshing to see Dolla and his friends, including Pascal Pinaud (Kebab à voeux, 2001) literally on the beach. If the teachers are relaxing, Dolla’s most recent graduates of Villa Arson are in the gallery just above. You only need to climb the stairs and cross the road to Galerie de la Marine. The title of the exhibition is Santé, which is a French salute to one’s health, usually accompanied by the clinking of glasses. Generally the work is of a high standard and looks conceptually and materially well handled, as one would expect of this school’s graduates. I find the work interesting and refreshing, especially for what is not there. The presence of video is noticeably absent, and given its prevalence internationally and that Villa Arson has an extremely well equipped audio-visual department, its lack of dominance is worth noting. A flatscreen TV was on the wall but its screen was black. Only one other work dealt directly with video, and that was incorporated into a sculptural armature that alludes to some form of mathematics. All the other work is tactile painting, sculpture and installation. Due to my lack of French, I struggle through the essay by Arnaud Labelle –Rojoux. The gist of it seems to wish these young artists well, whilst warning them of the pitfalls of the market and the ‘star academy.’ Labelle-Rojoux ends by quoting Chuck Berry with “C’est la vie, say the old folks, it goes to show you never can tell.” The show is in two parts and continues at Galerie a. de Nice in the old town; as you meander towards it you need to traverse the kitsch tourist art that abounds in the small shops and ateliers surrounding the Cours Saleya and Matisse’s studio. There you will find the usual fare of tourist art and the caricature artists. You might know the sort I mean, the ones who use a tonal charcoal drawing of Elvis or Marilyn as an advertisement for their skilful realism. Just outside the old town is the Galerie Soardi. 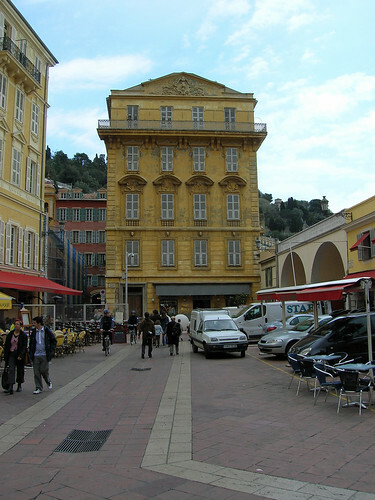 It is now one of Nice’s most impressive contemporary commercial galleries. The exhibition on show is House of colors by the German artist Tilman. It is a lively, playful exhibition with boxes of colour bouncing off the walls and floors as if they have just dropped in from Teletubby land. I read Tilman’s CV and see he lists his teacher on the first line. I wonder if this is a German tradition, for it seems unusual to credit any one teacher in a CV (one has so many?). I am also fascinated to see a name I am familiar with, David Thomas, a lecturer at RMIT University. David was teaching there when I was a student. I remember him as having an obsession with the colour yellow, so I enjoy seeing his name as a curator of an exhibition that included Tilman in Melbourne. I leave the Soardi in an upbeat mood, heading towards MAMAC. On my way I stop in front of a model shop where the space vehicles in the window remind me of the Yves Kline spacecraft that I already know from the MAMAC collection. Kline has a whole gallery devoted to his ‘blues’, but this curious rocket -type sculpture seems atypical. In the toyshop a glass case contains an assortment of guns and I ponder whether they are real or replicas; I can’t decide, but ask, why do guns and toys coexist as if it is normal? Guns also co-exist with art at MAMAC. Niki Saint Phalle shoots her canvases on one floor whilst hand-guns also greet you in Robert Longo’s retrospective. They are all titled Bodyhammer and then the name of the gun is listed - Uzi, Colt 38, etc. They are huge charcoal drawings that force you to look down the barrel of the gun. This show is where the colour of the Côte d’Azur, of Matisse’s yellow house, of Dufy promenades, of Tilman’s boxes, of Klein blues and Dolla’s coloured balls are counterd by the blackness of Longo, a New York artist. At first glance it is impressive, with the weight of the massive black drawings dominating the white galleries as if some massive burnt offering has given Longo an unlimited supply of black soot. However, it does not take long before the technique begins to irritate. In lots of ways it is incredibly immature, as Longo simply copies the tonality of photographs as many amateurs do. There is no doubt he does it with grand ambition and they are impressive if only for their scale and competence. However, it is the sort of technique that one might find in any first-year drawing class or by the caricaturist on the Cours Saleya. Normally this type of drawing would be discouraged by art lecturers around the world, for there is no sense of enquiry or investigation, just a surface that slips into an easy mannerism, a type of therapeutic, unthinking drawing. After one decides the photo to be copied, there is a process of obsessive copying of tones. In Longo’s defense, he is obviously aware of the limitations of this drawing technique and he takes it to the extreme point in scale; the result may not be Elvis or even Marilyn, but an impressive if shallow installation. In Untitled (the face) a huge wave is peaking as it rolls in towards an unseen shore. Is it a nightmare of a Tsunami that is out there lurking or a surfer’s paradise? Probably the former, for it is juxtaposed against a charcoal drawing of a nuclear explosion, Untitled (mike test / head of Goya), 2003, dominates the gallery at 183 x 244 cm. The idea of threat is continued with two drawings of sharks breaking the black sea to bare their teeth as they do in any number of TV documentaries. Even money is seen as a threat in a series of life-size small drawings of American multi-denomination bills, which are titled Weapons of mass destruction. It seems an appropriate reflection of a recent America, where politics have been simplified to the point of being either black or white, even their presidential elections. “You’re either with us or against us”  and the threats are coming thick and fast from man and nature. Guns, sharks, mushroom clouds and tsunamis are all threatening a population frightened by the contemporary politics of fear. Even though the exhibition is an impressive installation, each work is individually titled. Read individually or as a whole, Longo’s drawings promote a series of simplistic and stereotypical images that have no more depth than the paper they are drawn on. I prefer Dolla’s balls to the dollar bills of Longo. I leave MAMAC through its bookshop and arrive on the beach with a Noel Dolla catalogue. I lie in front of the azure sea and read about his 1999 MAMAC exhibition where he used a similar set of coloured balls on Place Yves Klein (where a Sol Le Witt large mural now sits in the window) and realize the title of the work at Castel is the same as his earliest exhibited piece in 1969. His use of fishing tackle and floats on strings literally ties his work much more convincingly to the beach than Longo’s sharks and tsunamis. As the sun sets, the Baie des Anges turns a velvety black. We enjoy the last night of our summer holiday with a lovely meal on the beach. I look up and see a portly man leaning on the balcony of Matisse’s studio, his ghost maybe? John Kelly (www.johnkellyartist.com) flew Aerlingus from Cork to Nice as a paying passenger. He received no gratuities from any restaurants mentioned. The MAMAC is a free museum. The Teletubbies is a kids TV programme with strong, pure, fresh colours. Though he did not teach me directly. Composite realities. ‘CPP’ stands for ‘Centre for Contemporary Photography’.